Footloose is the original soundtrack of the Paramount motion picture Footloose. The original nine-track album was released in 1984 (see 1984 in music) and reached number one on the US Billboard 200 chart on April 21, 1984, where it stayed until June 30, 1984. When it was re-released in 1998, four bonus tracks were added to the album. In 2002, Sony International released the Australian Souvenir Edition (aka Australian Cast Special Edition). Two megamixes were added to the album, featuring the Australian cast of the Footloose musical. 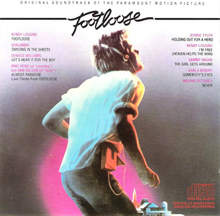 The original soundtrack contained six Billboard Hot 100 Top 40 hits, three of which reached the Top 10, including two number-one hits, Kenny Loggins’ “Footloose” and Deniece Williams’ “Let’s Hear It for the Boy”, and “Almost Paradise”, a duet by Ann Wilson and Mike Reno that reached number seven.